How safe is your home or investment properties? Diana Clement looks at a website that gives in-depth hazard reports specific to your property. How safe is your current or next home during a natural disaster? Price: $49.95 per report for casual users or $44.40 excl GST for subscribers. Wouldn't it be good to know before you buy a property if it's susceptible to landslide, flooding, tsunami, contaminated soil and so on? By finding this out you can make more sound investment choices. PropertyInsight.co.nz offers hazard reports for 900,000 New Zealand properties and can help investors find out just this information – although a hazard report is not an insurance policy against disaster. Hazard reports allow investors to make informed decisions and may change the way you think about one of your current properties or affect your decision if you're thinking about buying more. Property Insight offers two ways to get hazard reports. If you sign up as a subscriber, you can access reports directly through the PropertyInsight website. Casual users pay per report and are re-directed through to Quotable Value's website to get their reports. The reports look much the same, whichever source they come from – with the PropertyInsight logo on both, although it was more of a straightforward process to get it on the PropertyInsight website once logged in. It makes an awful lot of sense to become a subscriber, because there's no charge, and it's a much easier process to get a report directly on PropertyInsight's website. For subscribers, once you've logged in, you are directed to a map of New Zealand where you click on a regional and get boxes for the street and number. Your report is generated in another browser window or you can have a PDF version emailed to you. The search that I did on a random house in Manukau city returned a very in-depth 2,600 word report with good explanatory notes about what all the entries meant. These reports are formatted differently for specific industry groups. Just out of interest, I also did a search on a street in Abbotsford, Dunedin, which on the night of August 8, 1979 was hit by a major landslide destroying 70 houses and resulted in the evacuation of over 600 people. Interestingly the house had low susceptibility to slope instability, but was susceptible to flooding. The report went into details of soils in the area and the likelihood as a result of floods – in this case the historic flood return interval was "inferred to be less frequent than one in 100 years”. Property Insight uses a number of different data sets to make assessments. In the case of flooding, for example, these data sets range from regional geological and soil maps, to detailed local flood models. One thing I liked was the flexible options for membership. Property investors can choose to buy one-off reports, or sign up for membership. The latter is designed for large companies such as insurers, developers, real estate agents, law firms and so on, rather than individual investors. The BECOME A SUBSCRIBER page was one click from the homepage. The very first link sets out pricing clearly. There are prices for casual users, subscribers who want less than 100 reports per year and negotiable discounts for more than that number. Too often websites want you to sign up for on-going membership at a monthly fee that really doesn't make sense for investors. That isn't the case with PropertyInsight. 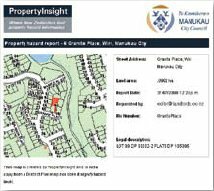 The website offers standard reports and premium reports ( currently the latter is for Manukau City only). Property Insight has a section with free information about how to minimise the impact of the hazards affecting your property. Subscribers can in addition download a 1mb PDF report on natural hazards in New Zealand prepared by PropertyInsight. I did manage to encounter a couple of annoying problems. PropertyInsight forwards users through to Quotable Value's website for certain reports. When I got there, it asked me to sign up as a user using my email address. Unfortunately I got a message saying "this user already exists", and it wouldn't let me login. I then figured out that I needed to find the hazard report myself and login. There is an 0800 helpline for anyone that couldn't work this out. I was a little surprised that the PropertyInsight website didn't inform me that I was about to be re-directed elsewhere. Another problem I encountered was when signed in as a subscriber, I couldn't get the search to work. It kept bouncing me back to the login screen. Eventually I worked out that the problem was that the website didn't like my version of Firefox (or perhaps any version of the popular browser), so I changed to Internet Explorer and it worked just fine. Finally, anyone interested in natural hazards in New Zealand should visit HazardWatch.co.nz. System requirements: Internet access and PDF viewer if you want reports emailed to you. Verdict: This is a well-designed easy-to-use website that provides investors with invaluable information. Pros: A reasonably idiot-proof site that you're not going to get lost in. Cons: As with most NZ published websites and software products I have reviewed, I did manage to find a number of glitches that could be ironed out.